Bosolo - CASE - Coolube 2210 metal cutting lubricant for non-ferrous metals. 100% natural, non-toxic. 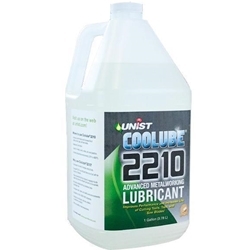 Home → Fabrication Tools → Cutting Fluids → CASE - Coolube 2210 metal cutting lubricant for non-ferrous metals. 100% natural, non-toxic. Coolube 2210 is formulated as a metal cutting oil and lubricant for metals, wood, rubber, and most plastics. It is 100% natural, non-toxic, non-staining, and will not oxidize (become sticky or leave a residue). Coolube 2210 cutting fluid does not contain any ingredients currently recognized as hazardous by OSHA, IARC or NIP. Coolube 2210 machining oil will never cause dermatitis and is formulated from cosmetic grade raw materials, which makes it entirely worker and environmentally safe.